Before the Revolution, it had been impossible to print an English language version of the Bible in the colonies, because no American printers held a license from the King granting permission to print the Bible. The war cut off shipments of Bibles from Great Britain, but also got rid of the need for the license; thereby creating a shortage of Bibles and the ability to print them in America. Robert Aitken stepped in to fill this void. 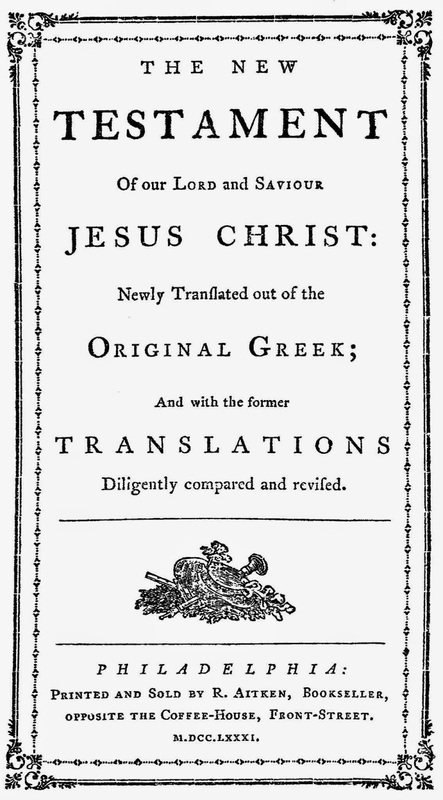 There are only three known copies of Aitken’s 1777 New Testament still in existence today. One can be found in the New York Public Library’s collection. Another belongs to the Philadelphia Historical Society. The last was auctioned off by Bloomsbury Auctions in London November, 2011 by an undisclosed seller. Demand was heavy, so every year, for the next five years, Aitken published a new edition of his New Testament. In total, he published five editions: Aitken’s second edition was published in 1778; his third in 1779; his fourth in 1780; and finally his last and fifth edition was published in 1781. I am unsure of the number of New Testaments Aitken printed each year, but I expect that it was somewhere between one thousand and ten thousand. It was not until 1782 that Aitken had his first complete Bible. He printed his 1782 Old Testament and added it to his previously printed 1781 New Testament. I believe that Aitken planned ahead and printed about ten thousand additional New Testaments in 1781 and had them waiting to be bound with the ten thousand Old Testaments he printed in 1782. If you look at my web site, you will notice that the 1782 Bible’s New Testament title page is dated 1781, while the Old Testament is dated 1782. 1782, or maybe 1783, was the only year that the Aitken Bible was published. I am pretty sure that these Bibles were not available (bound) until 1783. After the war, America was once again flooded with inexpensive Bibles from England. Aitken was stuck with way too many Bibles and was near financial ruin. The Presbyterian Synod stepped in and purchased Aitken’s remaining stock and gave them to the poor. My own photograph of an Aitken Bible, taken July 2011 at the American Bible Society in New York City. And the Plebes raise their right hands and recite the Oath of Office. Many of their parents and many of us assembled as a cloud of witnesses will be in tears as these vibrant young people pledge their lives to protect and defend our Constitution. You can run your hands over these words. They are engraved on a plaque affixed to the bulkhead (wall) in Bancroft Hall. You can feel your country’s history. Robert Morrison is not the first person to promote this blatantly false notion that every president has ended a four-word religious codicil to their presidential oath. But it is a new twist when he identifies the president as the commander-in-chief , because he is now suggesting that ending a military oath with "So help me God" should be understood as if it were a command issued by the President, as Commander in Chief. It is the motto of Plymouth, England.